'대방광불원각수다라요의경'은 줄여서 '원각경'이라고 부르기도 하며 우리나라 승려들의 교과과목으로 채택되어 불교수행의 길잡이 구실을 하는 경전이다. 한국학중앙연구원 장서각 소장본은 1465년에 간경도감 국역본을 저본(底本)으로 경문 및 주석의 한글 구결 부분만을 편집하여 주자소에서 을유자(乙酉字)로 인출한 금속활자본으로 1책(序, 卷上一之一)의 결본(缺本)이다. 이 책은 1465년 원각사를 준공한 기념으로 세조의 명에 따라 정난종 서체를 자본으로 을유년에 활자를 주조하여 간행된 판본으로 ‘을유자본(乙酉字本)’이라 불린다. 이 활자는 '원각경' 등 주로 불경을 간행할 목적으로 주성(鑄成)되었던 까닭에 당시 유신들의 강한 반대로 사용되지 못하다가 갑진자(甲辰字) 주조 시 이를 녹여 사용한 것으로 알려져 있다. 이러한 이유로 그 전래본이 희귀한 실정이며, 조선시대 국어학 및 서지학 연구에 중요한 자료적 가치를 지닌다. Mahavaipulya purnabudha Sutra (The Complete Enlightenment Sutra) constitutes the basic curriculum for monastic education of Korean Buddhist monks. The Academy of Korean Studies keeps the first volume from book one of the 1465 edition printed in euryu type, on the basis of an earlier Korean version compiled by the Directorate of Buddhist Publications. It includes the original Chinese text with Korean endings. 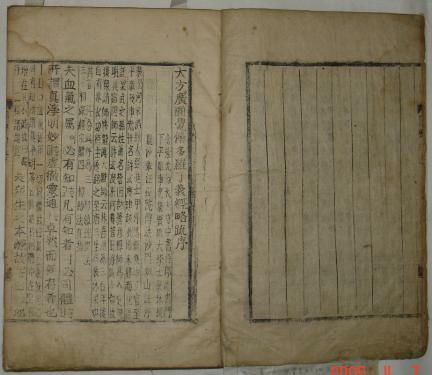 The sutra was printed in 1465 under the orders of King Sejo to commemorate the dedication of Wongaksa Temple in Seoul. It is called the euryu type edition because it was printed with the type cast in the zodiac year euryu, corresponding to 1465. The Confucian-oriented courtiers of Joseon opposed using the type because it was cast primarily for the purpose of printing Buddhist scriptures. It was melted in 1484 to be used in casting a new type, named gapjin type. This is one reason why few copies of the sutra remain today. The sutra is an important text for linguistic and bibliographic studies of the Joseon Dynasty.